on regular basis up to 28-12-2018 till 11.59 PM using HPPSC Official Website of http://www.hppsc.hp.gov.in/hppsc/ only. After this closing date the Website link will be disabled. Date of HPPSC Notification is 28-12-2018. HPPSC will conduct a screening test (objective type or descriptive type with 2 hours time duration), personality test and/ or Interview to select candidates for above Vacancies. 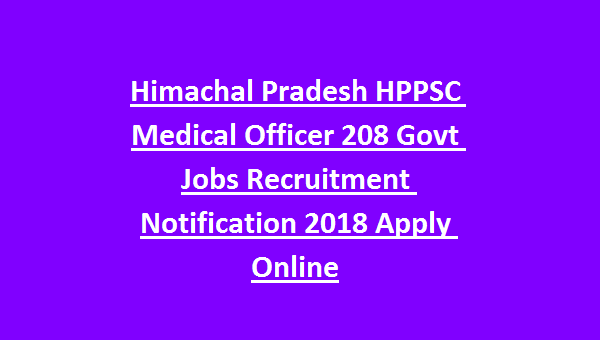 All details of Himachal Pradesh HPPSC 208 Medical Officer Jobs Recruitment mentioned below. 1. Date of HPPSC Notification is 08th Dec 2018. 3. Himachal Pradesh PSC Admit Card will be notified soon. 4. Tentative HPPSC Written Exam date will be updated soon. As per Notification of HPPSC, total available vacancies of class 1 gazetted general wing Medical Officer Jobs are 208. 1. Qualification for candidates must be Recognized Medical Qualification included 1st or 2nd schedule or 3rd schedule part 2 to Indian Medical Council Act of the year 1956. The date to determine Qualification must be 28-12-2018 only to submit Online Recruitment Application forms on Website. Candidates must complete rotating internship. 2. Desirable Qualification must be post graduation degree or diploma included 1st or 2nd schedule or 3rd schedule part 2 to Indian Medical Council Act of the year 1956. Candidates must have the Knowledge of manners, customs, dialects of the state Himachal Pradesh. Upper age Limit should not exceed 45 years as on Closing date of Online registration of Application forms. Selected candidates will get the Pay band of Rs.15,600/- to Rs.39100/- per month plus Grade Pay of Rs.5400/- plus other allowances. HPPSC will conduct a screening test, personality test and/ or Interview. Screening test is an objective type or descriptive type with 2 hours time duration. Interview/ personality test is for 100 marks. Qualifying score is 45 for general category candidates; 35 marks for reserved category candidates. Application Fee for General Category candidates is Rs.400/-; SC/ST/OBC of Himachal Pradesh state candidates is Rs.100/-. Ex-Servicemen category candidates of Himachal Pradesh has No Application Fee. 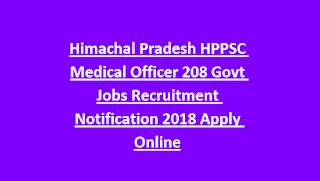 Interested candidates may apply Online using HPPSC Official Website of http://www.hppsc.hp.gov.in/hppsc/ on or before 28-12-2018 till 11.59 PM. Detailed Instructions for filling up the form are Available on Website. After submitting ORA, it is better to take print out of finally submitted form and submit it along with relevant attested documents, certificates etc on the day of screening test.